Limit Order is the default option of the Order Form in both EXCHANGE (spot) and MARGIN (margin) trading modes. This is to prevent slippage that is often caused by big market orders. 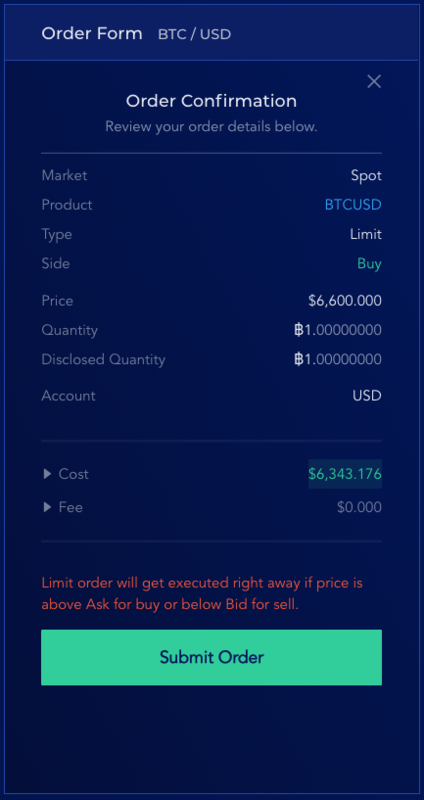 Below is a screenshot of the Order Form for a buy Limit order, in BTC/USD pair. Funding currency in this case is USD by default. 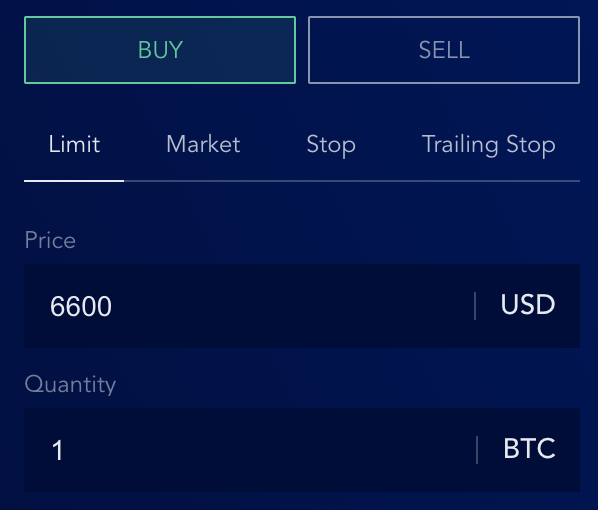 For example, this screenshot means you're buying BTC at $6600 and no higher. If market price is higher than $6600, system won't execute your order. This screenshot means you're selling BTC at $7000 and no lower. 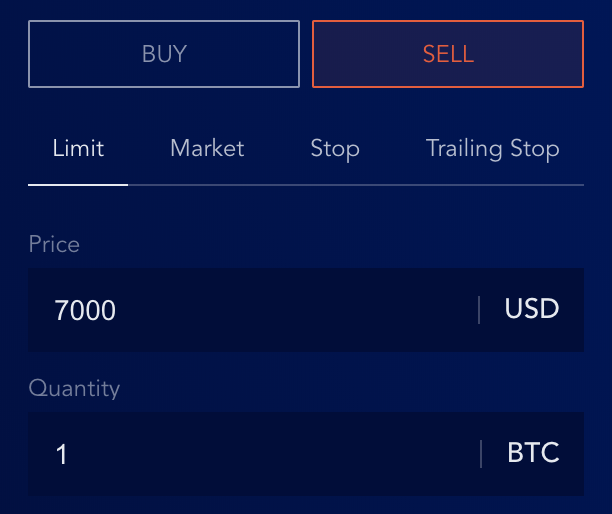 If market price is lower than $7000, system won't execute your order. lower than market price if you're buying. higher than market price if you're selling. If you try to place a Limit order the other way around, this warning happens. System will also estimate Cost and Fee for you. Click their Indicators to expand the content. Note that these numbers are just estimation and correspond with the specs of your order. Once you decide on a Price and a Quantity of your Limit order, you can click Place Order. System will prompt you to review and confirm the details of your order again before actually sending it to the Order Book. Market price is reflected in real time on Liquid in the Order Book panel. These shortcuts allow you to quickly choose to buy or sell 25% / 50% / 75% or all (MAX) of your balance in a currency account. 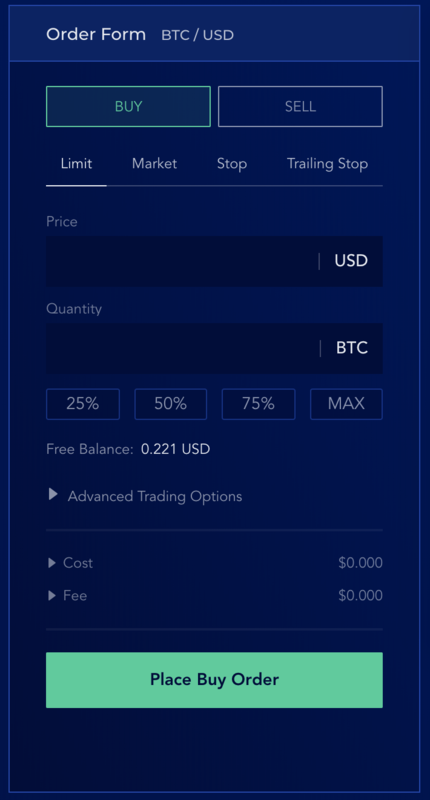 Free Balance indicates how much of your balance is available for trading or withdrawals. 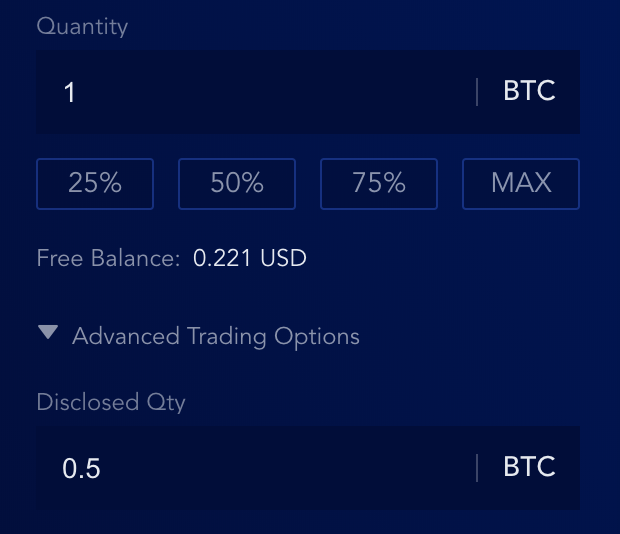 In this example, 0.221 USD is the Free Balance and the maximum value of any buy order placed from this account. "Disclosed Qty" specifies the quantity that will be visible on the Order Book once the order is placed. By default, Disclosed Qty is equal to Quantity. In the screenshot above, Disclosed Qty is set to 0.5 while Quantity is 1. 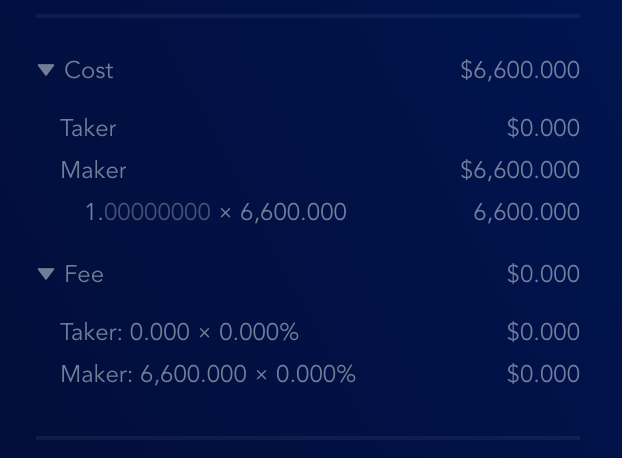 When the order is placed, Order Book will only show 0.5 BTC instead of the full quantity. This does not affect the matching ability of the order. The feature is mostly used when a trader wants to place a big order yet doesn't want people to know about it. A big order can easily change everyone's mind about the trend of a market.